Jonathan Moerdyk grew up in rural Michigan and obtained his Bachelor's of Science degree from Hope College in Holland, MI. An enthusiasm for organic chemistry coupled with research regarding novel organic photochromes under the advisement of Dr. Jason G. Gillmore propelled Jonathan to the pursue a Ph.D. in organic chemistry at the University of Texas at Austin. At UT, Jonathan's research focused on the design, synthesis, and application of new carbene scaffolds as useful reagents as well as mimics for transition metals. 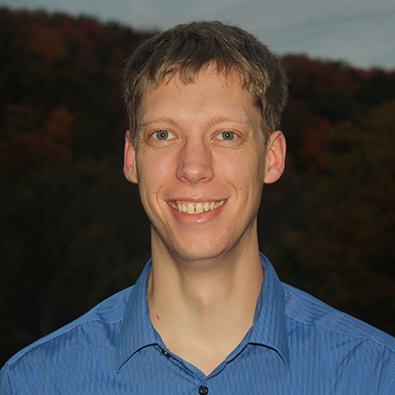 In the Fall of 2014, Jonathan started at Seton Hill University in Greensburg, PA as an Assistant Professor of Chemistry. He continues to enjoy working with students as well as developing an active research program. 20. Moerdyk, J. P.; Schilter, D.; Bielawski, C. W. “N,N'-Diamidocarbenes: Isolable Divalent Carbons with Bona Fide Carbene Reactivity”. Acc. Chem. Res. 2016, 49, 1458-1468. 19. Lee, Y.-G.; Moerdyk, J. P.; Bielawski, C. W. “Poly(2-imino-4-oxazolidinone)s via the Condensation of Diamidocarbenes with Bis(isocyanate)s” Macromolecules 2015, 48, 9081-9084. 18. Lastovickova, D. N.; Moerdyk, J. P.; Kelley, A. R.; Bielawski, C. W. “Assessing the Reactivity of N,N'- Diamidocarbenes Toward Compounds Containing p-Block Elements: The Activation of Silanes and Alanes”. Submitted to J. Phys. Org. Chem. 2015, 28, 75-78. 17. Moerdyk, J. P.; Bielawski, C. W. “Dihaloimidazolidinediones as Versatile Halodehydrating Agents”. Chem. Eur. J. 2014, 19, 14773-14776. 16. Moerdyk, J. P.; Bielawski, C. W. “Reductive Generation of Stable, Five-Membered N,N'-Diamidocarbenes”. Chem. Commun. 2014, 50, 4551-4553. 15. Chase, D. T.; Moerdyk, J. P.; Bielawski, C. W. “Exploring the Chemistry of N,N'-Diamidocarbenes with Organophosphorus Compounds”. Org. Lett. 2014, 16, 812-815. 14. Moerdyk, J. P.; Blake, G. A.; Chase, D. T.; Bielawski, C. W. “Elucidation of Carbene Ambiphilicity Leading to the Discovery of Reversible Ammonia Activation”. J. Am. Chem. Soc. 2013, 135, 18798–18801. 13. Moerdyk, J. P.; Bielawski, C. W. “Stable Carbenes” in Contemporary Carbene Chemistry. Moss, R. A.; Doyle, M. P., Eds.-in-Chief; Wiley: Hoboken, NJ. 2013; pp 40–74. 12. Chen, M.; Moerdyk, J. P.; Blake, G. A.; Bielawski, C. W.; Lee, J. K. “Assessing the Proton Affinities of N,N'-Diamidocarbenes”. J. Org. Chem. 2013, 78, 10452–10458. 11. Moerdyk, J. P. “Q&A: A Sustainable Chemist”. Nature 2013, 502, S59. 10. Moerdyk, J. P.; Bielawski, C. W. “N,N'-Diamidocarbenes Facilitate Selective C–H Insertions and Transfer Hydrogenations”. Chem. Eur. J. 2013, 19, 14773–14776. 9. Chase, D. T.; Moerdyk, J. P.; Bielawski, C. W. “Elucidating the Mechanism of Reversible Oxiranations via Magnetization Transfer Spectroscopy”. Org. Lett. 2012, 14, 5510–5513. 8. Lee, Y.-G.; Moerdyk, J. P.; Bielawski, C. W. “Exploring the Nucleophilicity of N,N'-Diamidocarbenes: Heteroallenes and Related Compounds as Coupling Reagents”. J. Phys. Org. Chem. 2012, 25, 1027–1032. 7. Moerdyk, J. P.; Bielawski, C. W. “Architectures of Polymers Synthesized using ROMP” in Polymer Science: A Comprehensive Reference. Matyjaszewski, K.; Möller, M., Eds.-in-Chief; El sevier: Amsterdam, 2012; pp 523–550. 6. Blake, G. A.; Moerdyk, J. P.; Bielawski, C. W. “Tuning the Electronic Properties of Carbenes: A Systematic Comparison of Neighboring Amino versus Amido Groups”. Organometallics 2012, 31, 3373–3378. 5. Moerdyk, J.P.; Bielawski, C. W. “Alkyne and Reversible Nitrile Activation: N,N'-Diamidocarbene Facilitated Synthesis of Cyclopropenes, Cyclopropenones, and Azirines”. J. Am. Chem. Soc. 2012, 134, 6116–6119. 4. Moerdyk, J.P.; Bielawski, C. W. “Diamidocarbenes as Versatile and Reversible [2+1] Cycloaddition Reagents”. Nat. Chem. 2012, 4, 275–280. 3. Moerdyk, J. P.; Bielawski, C. W. “Olefin Metathesis Catalysts Containing N,N'-Diamidocarbenes”. Organometallics 2011, 30, 2278–2284. 2. Hudnall, T. W.; Moerdyk, J. P.; Bielawski, C. W. “Ammonia Activation by a N,N'-Diamidocarbene”. Chem. Commun. 2010, 46, 4288–4290. 1. Moerdyk, J. P.; Speelman, A. L.; Kuper, K. E.; Heiberger, B. R.; TerLouw, R. P.; Zeller, D. J.; Radler, A. J.; Gillmore, J. G. “Synthesis and Photochemistry of Two Quinone Analogs from the Perimidinespirohexadienone Family of Photochromes”. J. PhotoChem. Photobio. A. 2009, 205, 84–92. Moerdyk, J. P. “Haber-Bosch: A Liberal Arts and Summative Assessment for a One Semester General Chemistry Course”. 2018 Biennial Conference on Chemical Education, South Bend, IN, Aug 2018. Hoover, W.* and Moerdyk, J. P. “Use of a Carbene as a Reactive CO Equivalent to Generate a Ketene Precursor”. 2017 Undergraduate Research Conference, Seton Hill University, PA, April 2017. Moerdyk, J. P. “Expanding Carbene Utility: Synthetic Potential and a Modular Indole-based Design”. St. Mary’s College of Maryland Natural Sciences and Mathematics Colloquium, St. Mary’s College of Maryland, St. Mary’s, MD, Oct 2016.